The merger of MKF-Ergis GmbH and Schimanski-Ergis GmbH into one company called MKF-Schimanski-ERGIS GmbH. Launching another line for nanoERGIS® stretch film production. The launch of the second line for the production of nanoERGIS® films at the Oława Plant. Obtaining the certificate BRC by MKF-Ergis Sp. z o.o. Establishment of the Ergis Group as a result of restructuring ZTS Erg Wąbrzeźno and the takeover of Schüpbach–Erg Sp. z o.o. and Delpak Sp. z o.o. The establishment of a factory of felt products in Wąbrzeźno, and its subsequent takeover by a company named Pe-Pe-Ge in 1926. 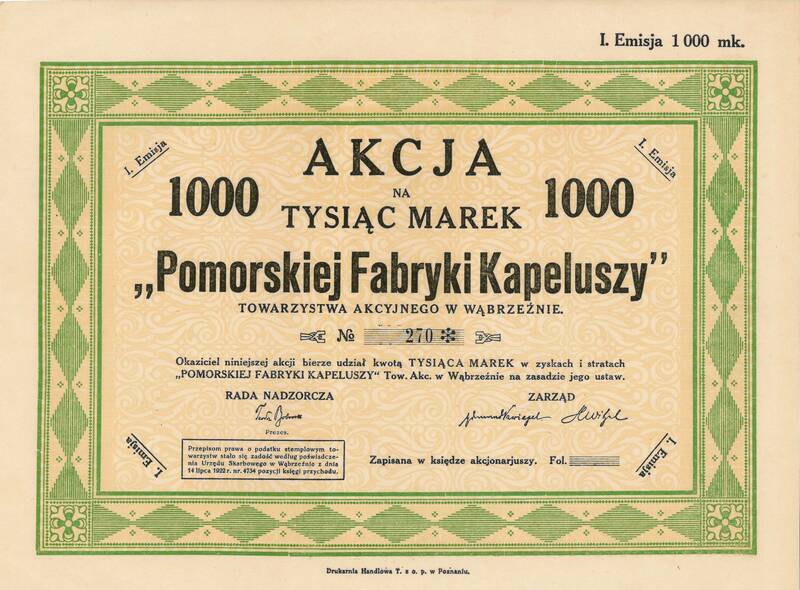 On 8 March 1922, the hat production company Pomorska Fabryka Kapeluszy Towarzystwo Akcyjne was established in Wąbrzeźno.Its main shareholders were the municipality of Wąbrzeźno and Polski Bank Handlowy T.A. in Poznań.The municipality of Wąbrzeźno was granted a guarantee by the Minister of State Treasury enabling it to take out a loan of DM 20 million to help finance the construction of the company’s factory, while Polski Bank Handlowy T.A. contributed equipment worth DM 40 million.The company’s share capital amounted to DM 120 million, divided into 120,000 shares. A four-storey building was quickly erected and hat production was commenced, a steam engine providing power for the entire factory’s machinery.However, the company soon encountered financial problems and difficulties in acquiring raw materials.On top of that, late deliveries hampered sales of finished products and led to the company losing customers to its competitors. In 1926, the factory’s shareholders agreed to sell it to Polski Przemysł Gumowy Pe-Pe-Ge from Grudziądz.On 3 September 1928, the Governor of the Pomorskie Province approved a project to set up a rubber products factory in the former building of Pomorska Fabryka Kapeluszy. Work was commenced on converting the building.The President of the company was Samuel Halperin, while Stanisław Blichniarz was the manager of the Wąbrzeźno branch.Initially, the factory produced water-resistant coats.However, thanks to a contribution made by one of the its co-owners, a French rubber manufacturer, it was able to purchase modern machinery and substantially extend its product range to include rubber coats, materials for gas masks, synthetic leathers, rubber footwear, synthetic suede, clothing for miners, rubber tricot, and water-resistant wallpaper. The company originally planned to employ a workforce of around 500, with an initial intake of 220 employees in July 1928. However, in the winter season of 1928/1929, the number of people employed in the factory was increased to 600.On 18 January 1929, the installation of a petrol tank manufactured by the Gdańsk shipyard was completed.Subsequent investments included building a factory boiler for vulcanisation and laying new water pipelines.Unfortunately, the economic crisis in Poland prevented the company from further development. In 1931, Polski Przemysł Gumowy was declared bankrupt, and in 1936 the insolvency administrator of Pe-Pe-Ge Polski Przemysł Gumowy S.A. began to sell off its machinery and equipment by compulsory auction.From 1932 to 1939, the company did not conduct any business activities and the factory building stood empty. Following the German army’s invasion of Wąbrzeźno in September 1939, the German authorities used the building as a prison for detaining and torturing political prisoners from Wąbrzeźno and the surrounding area.In the later years of the German occupation, it was used to produce parts for aircraft and submarines.Additionally, watches were produced, which was continued until January 1945. When the town was liberated, the factory was taken over by the tobacco company Polski Monopol Tytoniowy, which used it for fermenting tobacco.This continued until March 1950. A month later, refurbishment work was commenced for the purpose of creating a new company.Pomorskie Zakłady Tworzyw Sztucznych, which specialised in the processing of polyvinyl chloride and the production of soft PVC film for use in the construction and office and stationery industries, was officially opened on 10 October 1950. In 1975, the company changed its name to ZTS ERG Wąbrzeźno and started up production lines for vinyl wallpaper.Ten years later, it expanded its product range to include paper wallpapers.In 1994-1995, the company signed up to the General Privatisation Programme and acquired a new main shareholder: the Fifth National Investment Fund “VICTORIA”.In April 1998, it changed its name to ERGIS S.A.